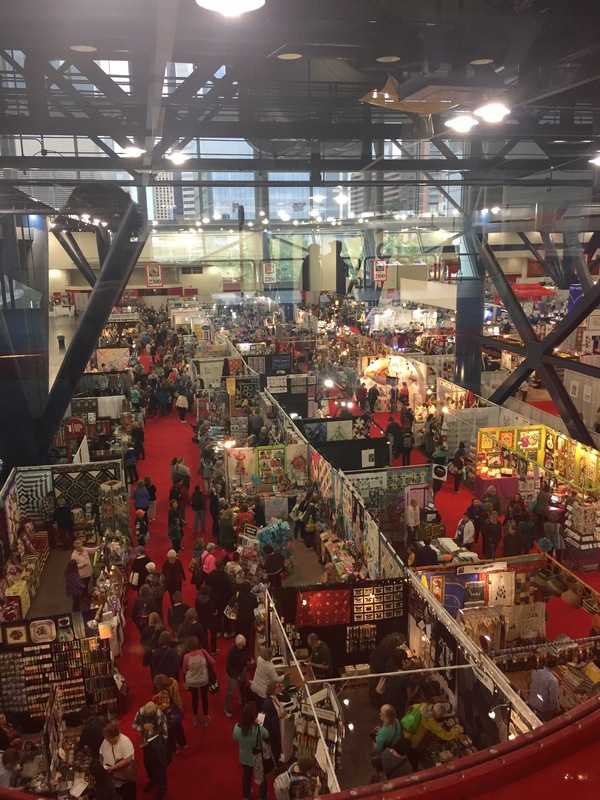 When my mother invited me to join her Broad Strokes art quilt group in Houston, at this year’s International Quilt Festival, I didn’t hesitate to say “yes”! One of the eight group members had a quilt accepted into the show and we were all excited to see it. Going to the show has been on my Bucket List for years! The show runs from a Monday through Sunday in early November, and is held at a large convention center. Classes are held each day and the quilt exhibit and vendor booths are open Thursday through Sunday. The Show was awe-inspiring and overwhelming at the same time! I was amazed at the range of quilts, and loved that they came from all around the world. Quilting is truly an international language! I found the exhibit area to be well-lit and spacious, with excellent signage. I never waited more than a few seconds to get a good look at a quilt. It was great fun to meet favorite Moda fabric designers Vanessa Christenson and Janet Clare, and collage quilt designer Laura Heine. The Show inspired me and sparked some fresh ideas for upcoming projects! Get the Festival App. The App debuted this year and was easy to use and handy. I could quickly navigate to particular exhibits or vendors, and I enjoy comments and posts from Show attendees and vendors. Make dinner reservations before the Show. Plan ahead, if you want to eat within walking distance of the Convention Center and nearby hotels. Catch a cab: it’s a short cab ride to other restaurants in Houston and the $6 flat fee for transportation in the downtown area doesn’t hurt! Try local Mexican food: There are many good Tex-Mex restaurants, but our favorite meal was at Xochi which serves Oaxaca-inspired food and drink. It was one of the best meals of my life! Stay a While: Although Mom and I didn’t take any classes, two days was barely enough time at the Show. If I go again, I’d try to stay 3 or 4 days. Visit on Sunday: I caught a quick hour in the vendor area on Sunday before we left for the airport and it was pleasantly quiet. I actually saw vendors and items that day that I had not seen before, due to the crowds. Pace Yourself: there are 1.8 million square feet in the George Brown Convention Center, where the show is held – about 30 football fields! We took breaks and naps to prevent physical and sensory overload. Wear Sneakers: I saw a lot of fabulous western boots on women at the show, but wearing running shoes kept my feet and legs happier than more stylish shoes! And now a feast for your eyes! ← Member Spotlight – Shawna’s Update!